Few places in Australia offer such a diversity of pristine scenery and hiking options as the Victorian Alps. Striking alpine, sub alpine and stunning temperate forest landscapes make for a mesmerising walk. With breathtaking panoramic views over the alps and surrounding plains almost daily, views like these can only be reached on foot. Take a breath and be filled with the scent of fresh alpine air while the stresses of modern life will be left behind on these stunning alpine hiking trails. The Great Alpine Walk is a paradise for photographers, wildlife and outdoor enthusiasts alike. Highlights include the breathtaking Razorback Ridge to Mt Feathertop – the second highest peak in Victoria. The undulating ridge walk offers panoramic views all the way and is complemented beautifully by the descent through stunning Mountain Ash forest to Harrietville. The walk from Hotham to Falls Creek via the Cobungra Valley, Derrick Hut and Dibbins Hut is not only epic, but provides a real sense of accomplishment. The historic huts circuit walk will delight history buffs and remote Mt Tabletop is a splendid place to sit and ponder the dramatic beauty of the region. Every last detail is taken care of so you can fully experience this stunning landscape stress free. The private accommodations are of high quality with ensuites and complement the region. The chef-prepared breakfasts and dinners make indulgent bookends to each day. With two outstanding guides looking after you, you can pace yourself because we can offer a choice of easier or harder walking options along the way. Australian hotel accommodations charge the same price per room regardless of whether there is one or two people occupying it. In order to cover the cost of the accommodation when occupied by one person we need to charge the single supplement fee, a cost that we make no margin on. Distances are longer up to 20km. Steep hill sections and rough surfaces. Walking experience and active lifestyle necessary. The Great Alpine Walk begins in Melbourne at 8:30am or at the airport at 9am. Travel via Milawa, Mt Beauty to Falls Creek Alpine Village. As part of the enormous Australian Alps National Park, the area is covered in a blanket of snow from late May to November. After this, the winter snows melt and flow as life-giving fresh water into Australia’s rivers. The grasslands and boggy areas hold vast amounts of water, allowing a never-ending supply for alpine rivers and streams even during the driest of summers. The rolling plains become a cool refuge from the hot valleys below, supporting masses of spectacular wildflowers and extensive snow grass plains. An easy late afternoon walk provides you with a good orientation to this unique alpine ski village. Great Alpine Walk starts by following an easy Aqueduct Trail connected to one of Australia’s early hydro-electricity schemes, built between the 1930s and 1950s. Mountain cattlemen’s huts feature prominently on this holiday. Today you’ll visit the oldest in Victoria, Wallace’s Hut as well as Cope Hut, once known as the ‘Menzies of the High Country’. The ancient snow gum trees here are twisted and gnarled by centuries of harsh winters. After rain or fog these tree trunks change colour to brilliant shades of red, orange, yellow and green. The route continues around the shores of Rocky Valley Dam to a delightful lunch spot. After lunch, there will be a choice of an easy walk following the lakeshore back to the bus or a harder hike to the summit of Mt McKay with stunning 360 degree views. Then through the Falls Creek alpine ski area to get back to the lodge. 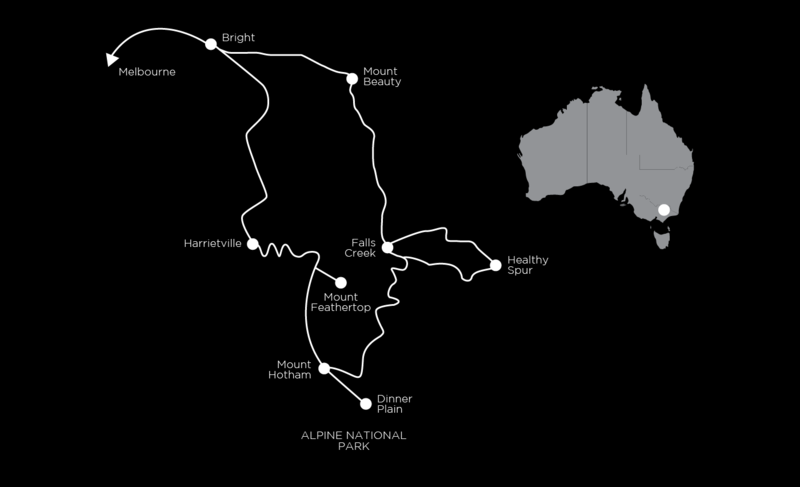 Today’s alpine hiking trail will take in some of the Falls Creek peaks and pass another couple of the historic huts. The route begins along easy aqueduct trails again before climbing up through gently graded snow plains to visit secluded Fitzgeralds Hut. One more hut today – historic Edmondsons Hut where we’ll enjoy lunch amongst the twisted but beautiful snow gums. The easier option for the afternoon takes us along Watchbed Creek and back to the bus. The more challenging option heads up onto Heathy Spur and then cross country on a compass bearing to Roper Lookout. The track then descends to the shores of Rocky Valley Dam. Few people, even locals, have done the walk all the way from Falls Creek to Mt Hotham. Here, we follow a section of the Alpine Walking Track (750 km between Walhalla and Canberra). You’ll be more likely to see brumbies (wild horses) than people here. Along the way, drop steeply down to the Cobungra River and Dibbins Hut (sometimes also called ‘Creep-Inn’ – you’ll see why), and then back through the Mt Hotham ski village. Skiers flock to Hotham for its renowned powdery snow. It is easy to see how the surrounding steep valleys would provide protection from strong winter winds, allowing snow to settle gently into deep drifts. Those taking the more leisurely option will do a shorter walk and then travel by bus to Mt Hotham. Today’s alpine hiking trail meanders through snow gum forests and across thick snow grass plains, where there are many spring wildflowers. The standard 10 km track to Dinner Plain is easy, but you can also add an optional 12 km return bushwalk to the aptly named Mt Tabletop. Accessing this remote mountain requires passing over some uneven terrain. Cattle once grazed these plains, and you’ll see the historic huts and cattle yards made by felling trees into piles. Walk into Dinner Plain, the highest freehold land in Australia, where every building is traditionally constructed with mud brick, weathered timber, local rock and galvanized iron. Another big walking day today on the Great Alpine Walk. The hiking starts along the breathtaking Razorback Ridge, surely one of the most dramatic walking routes in Australia. As you progress, Mt Feathertop gradually looms more and more impressively. The final (optional) steep climb to the summit of Mt Feathertop standing at 1922m is unparalleled. The rest of the day is spent walking down the gently graded Bungalow Spur to the township of Harrietville. The spur is covered by tall and most impressive mountain ash trees. An easy two-hour walk through picturesque Bright Gorge and along the Ovens River finishes off the walking for this tour. There are numerous sluices, tailings, mines and shafts remaining from the gold mining days. After morning tea in Bright, travel back to Melbourne, arriving at the airport around 5pm. The alpine hiking trails are reasonably well graded and mostly easy to negotiate. Full day walks on the Great Alpine Walk average about 17km. There are great opportunities for fit walkers to challenge themselves on at least two of the days where we walk over 20km. *Walk grading and map are not to scale and indicative only. We will stay in three very comfortable accommodations all with ensuites on the Great Alpine Walk. The first three nights are spent at Diana Lodge and is best described as a quality ski lodge. We have been staying with Lisa and her team for twenty years or so and it’s their personal service that really makes this place special. Then it’s onto the 4 star Ramada Resort at Dinner Plain for a further two nights. The resort is in a marvellous location in a really beautiful alpine setting but also enables easy access to the Dinner Plain hamlet. The last night is spent at Bright Motor Inn, a quality motel alongside the Ovens River. The two course dinners are prepared by chefs at the lodge and resort restaurants with a focus on local fresh organic produce. The last night in Bright will be at a local restaurant. These mountains are known for its freshwater trout and excellent local wines. Every day you will wake to a cooked breakfast in the restaurant to ready yourself for the upcoming days walk. You’ll lunch at incredible locations. Indeed, the walkers lunches complete the circle ensuring that your appetite is always kept satisfied. Our walkers lunches are substantial and may include a high protein type salad, a roll or a wrap, a muesli bar, cake or muffin of some kind and a piece of fruit. Each day is slightly different. Lunch is always augmented by Auswalk’s famous trail mix. Alcohol or drinks with meals are not included (except tea/coffee and juice with breakfast). The Alpine hiking trails vary in quality but all of the tracks are easily passable. There are some opportunities for fit walkers to challenge themselves but in the main the walks are all moderate, bar the Falls to Hotham walk which is challenging only because there is no easy pull-out point. This trip operates with two knowledgeable engaging guides so we can offer easier and harder walk options along the way. Please ring the office if you need further advice on the Great Alpine walk, if you need to we can have you speak to one of our guides. Pre and post tour accommodation: There are many good hotels in Melbourne, however we pick up and drop off at one central accommodation, the Alto Hotel, 636 Bourke Street. The tour starts at the Alto Hotel on Bourke at 8:30am or Melbourne Airport at 9.00am. We arrive back in the Melbourne at approximately 5.00pm on the last day. For what to bring please refer to Gear Advice on our FAQ section. We can only walk in the warmer months when the weather is walking friendly and the wild flowers are out in force. See the Bureau of Meteorology’s information about temperatures and rainfall ahead of time to ensure proper clothing. We strongly recommend purchasing a travel insurance policy as we charge a cancellation fee if you cancel your Auswalk holiday after we have confirmed it. There is a 30% discount with QBE on travel insurance booked via our website. Get an instant quote and purchase online now. For nearly 30 years we have taken pride in providing seamlessly organised walking holidays, but we know, even with that in mind, that you’ll have many more questions. You will receive a very detailed information pack and itinerary approximately 6 weeks out from departure outlining all the fine detail and much more. If you have any questions, feel free to ask one of our destination consultants or to speak with one of our guides about the Great Alpine Walk. You can get in touch with us via our contact form, email us at info@auswalk.com.au, or call us on +61 3 9597 9767. Submitting this completed form along with your deposit is a tentative booking only.